City Blosssoms fundraiser | Where have the days gone? I was recently reading Barbara Kingsolver’s book Animal Vegetable Miracle, which is essentially about knowing where your food comes from, and the value of eating locally. I do try as much as possible to eat (and drink) locally, especially as we travel to various regions of the country and the world. Did you know that it typically takes far more energy to get food to you (production/processing/transportation) than the energy the food provides? Also, many children grow up not knowing where food really comes from, and thus are unable to make good food choices, contributing to health issues in addition to the energy consumption issues. In an effort to mitigate these problems, I’ve decided to organize a project this month to raise funds for City Blossoms, a non-profit organization in Washington DC whose mission is to “develop and implement innovative programming and tools that build healthy neighborhoods and schools through creative kid-driven green spaces.” This is a great organization (I know because my daughter-in-law is their Director of Operations!) which benefits not only underserved DC neighborhoods, but also works with organizations in other cities to implement a similar model. Updating their Studio’s kitchen (officially named La Cocina) to create a workshop space for early childhood educators from their Kennedy Street neighborhood to come learn about cooking with children age 2-5. Hosting workshops for the Youth Entrepreneurship Cooperative (YEC) summer students to learn skills to develop their cooperatively run business, Mighty Greens. Last year YEC students made a profit $11,025 from selling soaps, balms, lotions, seedlings, and a CSA all from products from the gardens they manage. The profits were divided among 55 students. Expanding their Community Green Space (CGS) program to include The Farm at Kelly Miller. The Farm, located in Ward 7, will be collaboratively run with Dreaming Out Loud and the DC Department of Parks and Rec and it will be their largest CGS to date. 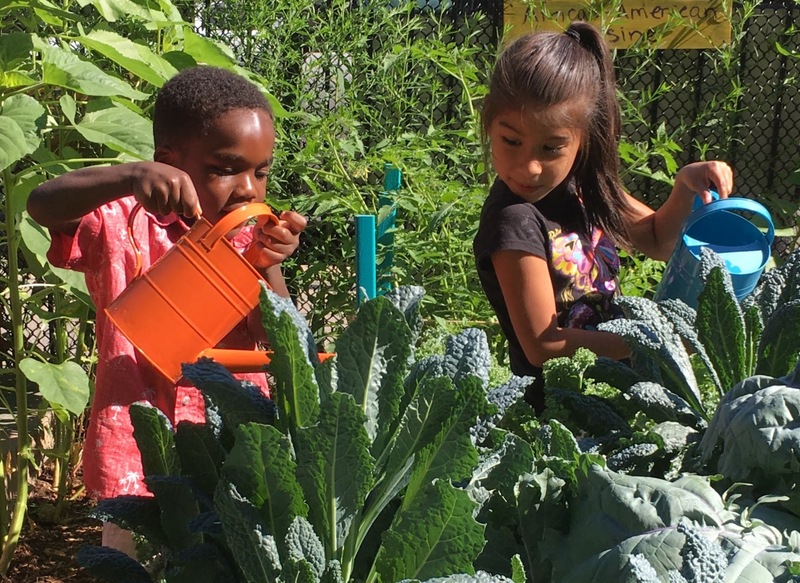 And here are a few statistics demonstrating the impact City Blossoms has: Annually, they serve 13,000 children, host roughly 770 volunteers, grow 1,200 pounds of produce, and provide 254 hours of free programming. They have 23 gardens in the District and they have done trainings for schools and educators around the country in 7 other cities. For more information, please also see their detailed Strategic Plan for the next 3 years. And here’s a brand new video from PBS News Hour about the Youth Entrepreneurship Cooperative program (Mighty Greens)… How cool! Please consider donating to this worthy organization – here’s a link!